Surface irrigation and sprinkler irrigation are the main systems of irrigation practiced in the world. Although surface irrigation is the oldest and most extensively used method of applying water to crops, the use of sprinklers is emerging fast. The latest addition is the microirrigation system, but its use is currently confined to intensive horticulture (Periera, 1999). Sprinklers and microirrigation systems are definitely better and much more efficient than surface irrigation systems (Pitt et al., 1996; Lamad-dalena, 1997; Ramalan and Hill, 2000). However, the cost involved in installation and maintenance will keep their adoption restricted, and surface irrigation will continue to be the main irrigation system (Heermann, 1996). Most surface-irrigated areas are supplied with water from a canal system. In general, supply rules are rigid, and often the time interval between successive deliveries is too long. 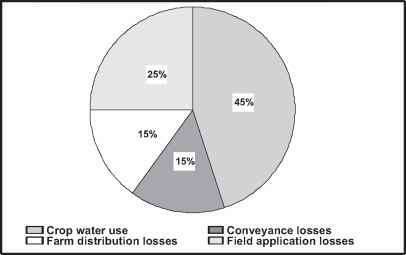 Irrigators tend to compensate for this by applying all the water they are entitled to use. This leads to substantial water wastage through evaporation and percolation. Excessive applications also result in reduced crop growth, leaching of plant nutrients, and waterlogging. According to an estimate (FAO, 1994), on average, only 45 percent of the water is used by the crop, with an estimated 15 percent lost in the water conveyance system, 15 percent in field channels, and 25 percent in inefficient field applications (Figure 4.2). Based on certain assumptions, T. Cummins (personal communication) estimated that in the Murray-Darling Basin of Australia, average water application efficiency in dairying is 0.4,0.6 in rice, 0.75 in cotton, and 0.6 in horticulture. Considerable space exists for more accurate and efficient crop water application by improved field irrigation methods and better crop water management techniques through the introduction of irrigation scheduling and water-supply control (Goussard, 1996; Liu et al, 1997). Irrigation scheduling is not yet utilized by the majority of farmers, and only limited irrigation scheduling information is utilized worldwide by irrigation system managers, extension officers, or farm advisers. It is well recognized that the adoption of appropriate irrigation scheduling practices could lead to increased yields and greater profit for farmers, significant water savings, reduced environmental impacts of irrigation, and improved sustainability of irrigated agriculture (Malano, Turral, and Wood, 1996; Smith et al., 1996). 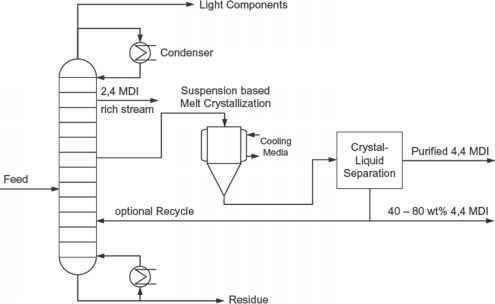 This concept is illustrated in Figure 4.3.